A splendid specimen. The crystals, even though not being very tall, are very clear and bright, with well-defined faces and edges, doubly-terminated and with some hydrocarbon inclusions and they airily sit on a very esthetic matrix. 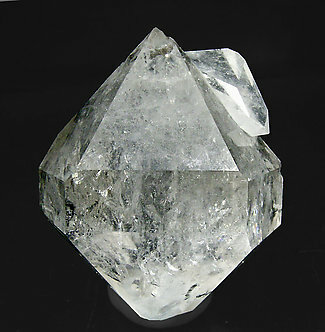 Doubly terminated Quartz crystal, with a short prism, very clear and brilliant, contrasting with a dark matrix. Very popular specimens at French mineral shows, where were called “Diamants de la Drôme” (Drôme Diamonds). 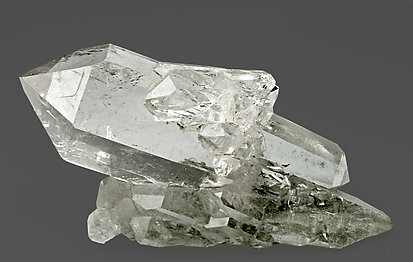 Group of doubly terminated Quartz crystals, one of them clearly dominant, with excellent transparency and good brilliance. The crystal that serves as a base seems broken but is undamaged, with curious face growths. The piece is accompanied by a handwritten label from the Folch collection. Partially doubly terminated crystal, with color zonations that are more intense on the terminations, on a group of milky Quartz crystals. Very uncommon locality. 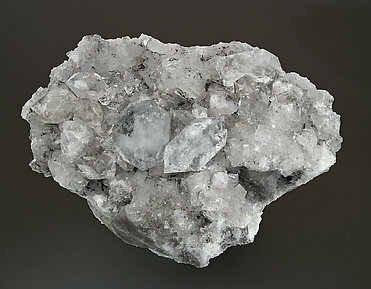 Group of doubly terminated crystals of Quartz, one of them clearly dominant, with many inclusions. 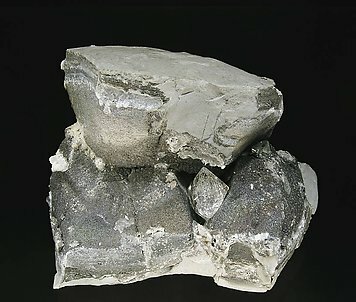 Partially coated by Arsenopyrite crystals and leafy aggregates of Muscovite. Two very bright and well defined doubly terminated crystals with abundant inclusions and with Baryte. 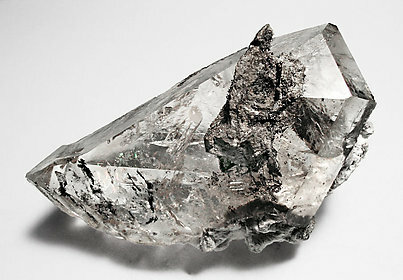 The secondary crystal is slightly flattened by an overgrowth of two opposite faces of one of the terminal rhombohedrons. The sample is from a recent find of a big geode in the locality. Unfortunately only a few specimens were saved and complete. 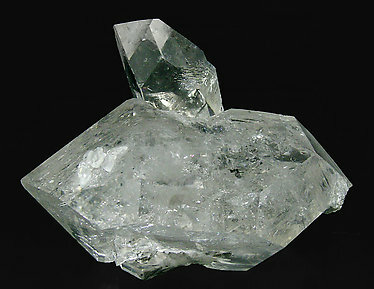 The Emilio mine is very well known for colorless Fluorite crystals but Quartz is very uncommon there. This specimen was photographed for the ‘Sainte-Marie Show 2009’ section of the magazine ‘Minéraux et Fossiles’ and appears on page 17 of number 383. 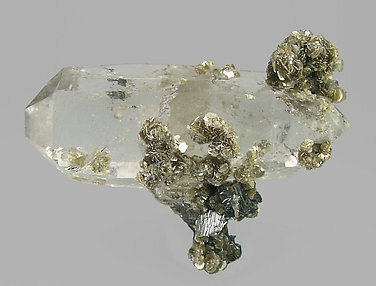 Very aerial aggregate of doubly terminated Quartz crystals with polycrystalline terminations and a grey color, due to Boulangerite inclusions. 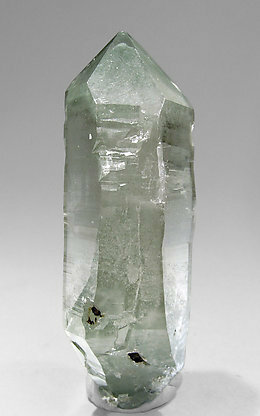 Doubly terminated floater crystal with neat phantom growths underlined by Chlorite inclusions, especially on terminations. 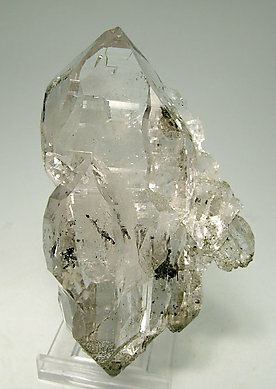 Group of three short prismatic crystals, doubly terminated, transparent and bright. They have hydrocarbon inclusions and are partially covered by little cubic crystals of Fluorite. 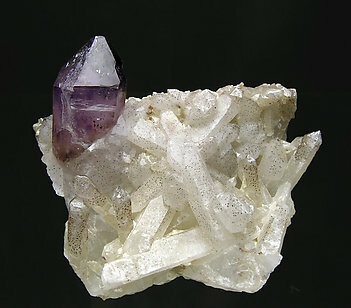 Doubly-terminated crystals on matrix, with hydrocarbon inclusions, on the classic colorless Fluorite typical of this mine, and also with little crystals of Baryte. 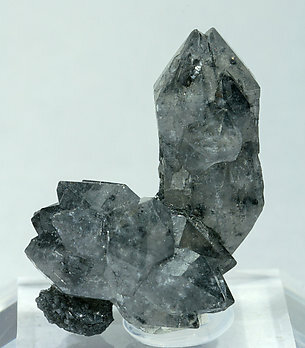 Aggregate of Quartz crystals, most of them doubly terminated, with a considerable length for the locality and very rich in fluid hydrocarbide inclusions, some of them mobile. The sample is formed by two doubly terminated and complete crystals. The smallest has an unusual crystallographic habit. Both crystals are bright and have abundant mobile hydrocarbon inclusions. A magnificent classic of Berbes. 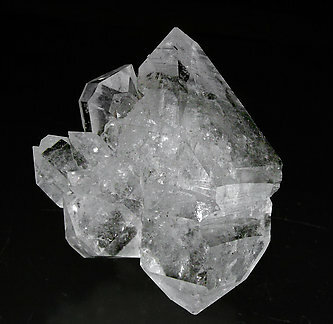 Group of doubly terminated crystals of very well defined faces and edges and with abundant fluid inclusions with hydrocarbons of organic origin. The most important of the bubbles, on the upper pyramid of the main crystal, is mobile. Parallel growth of doubly terminated crystals very different than usual for the locality, resembling Alpine pieces. 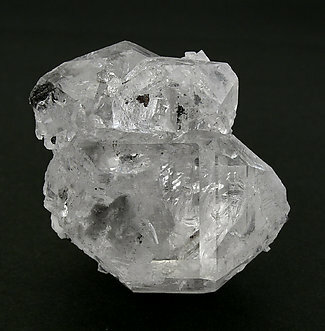 Thick and neatly transparent, they have a very intense luster and have unidentified inclusions. 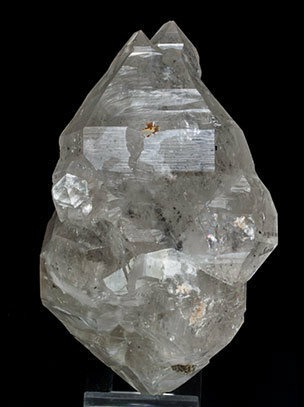 Complete Quartz crystal, with irregularly grown faces and dissolution forms (no fractures) on the back side. This crystal shows inclusions and small matrix fragments with laminar Baryte crystals on its surface. 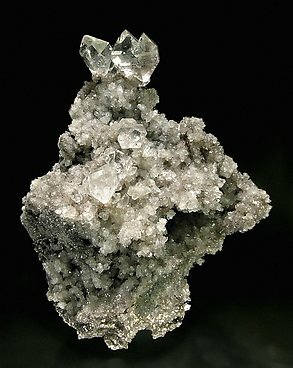 Two very bright and well defined doubly terminated crystals with abundant inclusions and with a small concretion of Pyrite. The sample is from a recent find of a big geode in the locality. Unfortunately only a few specimens were saved and complete. The Emilio mine is very well known for colorless Fluorite crystals but Quartz is very uncommon there..